Blackinton MIB2279 Mini Sunburst Eagle Badge - MIB2279 - 1 1/8" x 1 1/2"
Home > Blackinton > Police Badges > Mini Police Badges > MIB2279 Mini Sunburst Eagle Badge - MIB2279 - 1 1/8" x 1 1/2"
MIB2279 Mini Sunburst Eagle Badge - MIB2279 - 1 1/8" x 1 1/2"
The Blackinton Mini Sunburst Eagle Badge is a miniature version of a classic law enforcement style, topped with a detailed eagle. It is highly customizable, and makes a great gift or souvenir. The center circle comes with your choice of seal from a large collection that includes law enforcement designs, state seals and other types. The outer circle and upper panel are engraved with custom text in blue, red or black block lettering. 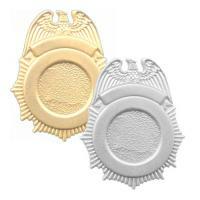 The mini-badge is made from durable enamel, and comes with a gold or rhodium finish. It also features either a money clip, wallet clip or safety catch for portability. ©2002-2019 CopsPlus.com: Blackinton MIB2279 Mini Sunburst Eagle Badge - MIB2279 - 1 1/8" x 1 1/2"